The Rimrocker Trail runs long stretches through remote areas (that’s why it’s awesome). Large portions of the route are rough, narrow and steep (again, awesome). The route between Nucla and Moab is recommended for 4WD/High Clearance vehicles and OHVs only. When traveling on the Rimrocker, users should plan to be self reliant and recognize that cell phone coverage is very limited. 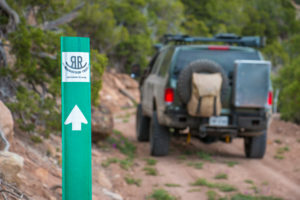 On the ground marking of the Rimrocker Trail consists of fiberglass posts featuring a highly reflective sticker of the Rimrocker Trail logo and a directional arrow.Even though the Web Map Viewer shows a marker symbol for each mile point on the route, on the ground posts do not show the mileage and are not always located at a mile point. Instead, some signage is placed at locations where the trail intersects other roads in order to assist users with staying on the trail. Be aware that not all intersections are marked. It is highly recommended that Rimrocker Trail users adequately plan ahead before getting on the trail and familiarize themselves with the route. Montrose County is home to 41,412 neighbors in over 2,200 square miles in the Uncompaghre River and Paradox Valleys. In addition to being the Agricultural hub of the western slope, we are home to Black Canyon of the Gunnison National Park, as well as the Gunnison Gorge National Recreation and Wilderness Areas. The majority of our County is made up of National Forest, Bureau of Land Management or National Park lands.